For several days now I’ve been in an ecstasy of looking. 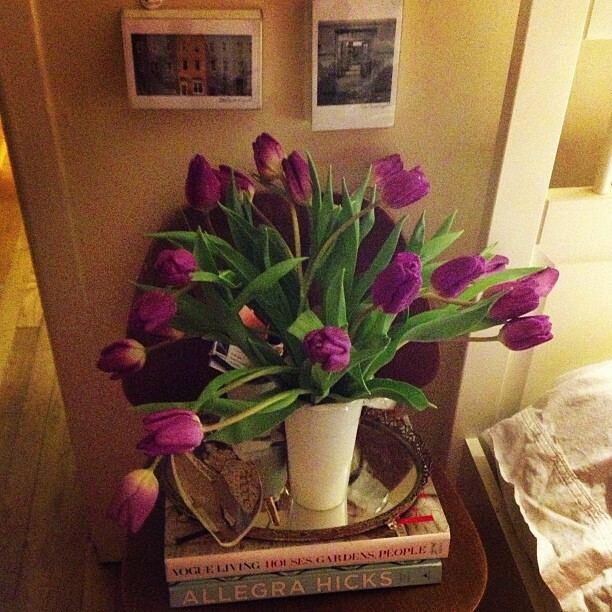 It started, surprisingly, not when I came home with three bunches of tulips thanks to a sale at Whole Foods, but when the double bunch of lush purple ones started to wither after doing that spectacular exploding in all directions thing tulips like to do. Normally I would have just chucked the whole lot in the bin, but since I’m home all day right now, I took a break from work and separated the ones that were still vibrant into smaller bunches around my apartment. One ended up in a vase on the window ledge in my bathroom next to a pink Eiffel Tower and a giant glass jar that I use to store my soap. (It was once upon a time filled with hundreds of jelly beans, but I digress.) It drooped against the wall to its right, and I was struck by a sense of loneliness and melancholy. A few days later, it had straightened up but the individual petals had started to relax into a series of waves, and I thought, “ah, windswept.” It also, for some reason, reminded me of an older woman with a head of gorgeous silver hair. I’d of course known people to go into raptures over flowers—May Sarton and Georgia O’Keeffee to name a couple—but I’d never experienced that particular rush of feeling myself. I was struck most by how, as the flowers wilted, they became even more sculptural, a little like bone, a little like wind. 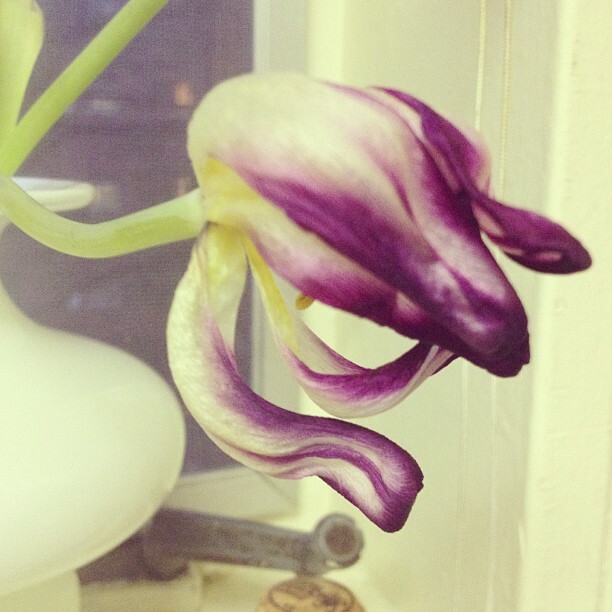 I was also struck by the fact that as I took the time to really look at each bloom, I felt something. I can’t quite articulate what that something was—a moment of pure aesthetic joy, perhaps?—but it was beyond merely noticing that they were pretty. Holding the gaze with each blossom resonated in some complex way I don’t understand. Perhaps the only way to put it is that it felt a little bit like holding a poem in my eyes without intercession of pen and paper. I also felt the frustration of not being able to capture exactly what I was feeling as I took Instagram after Instagram each time a blossom made me catch my breath. But isn’t that always the frustration of the artistic impulse—that you can come close, oh so close to whatever has provoked you to write, paint, dance, but the experience itself always remains ever so slightly out of reach? 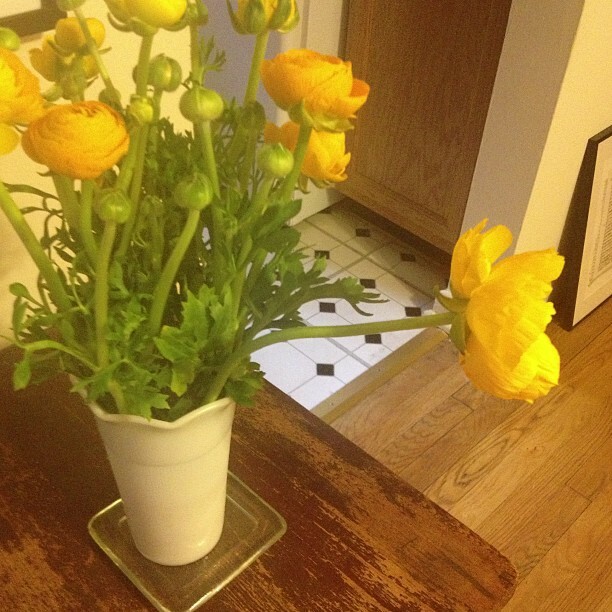 The tulips are gone, but a bunch of lovely ranunculus has arrived to take their place. I laughed out loud as I noticed that the only one that had so far opened up into a brash blossom had somehow craned its neck to separate itself from the pack in a most determined manner. 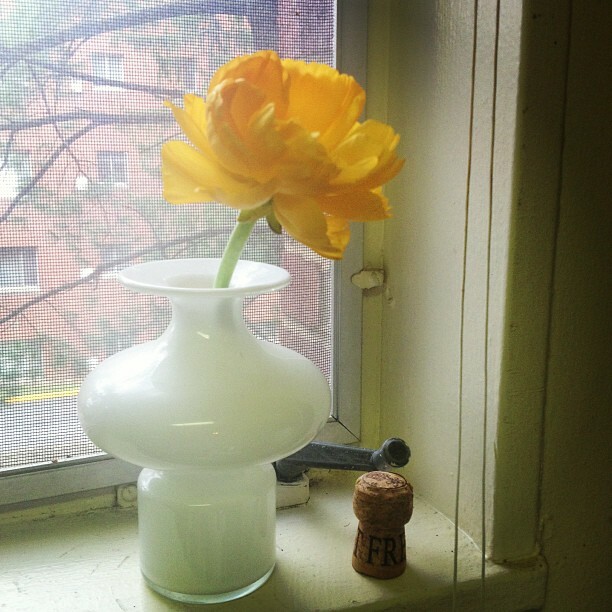 Thank you, oh ranunculus, for that moment of pure, unmarred joy. 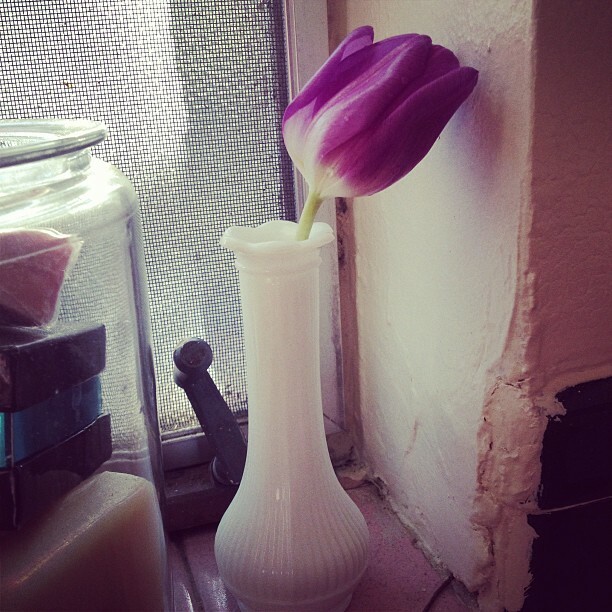 Posted on March 20, 2013, in Uncategorized and tagged contemplation, ecstatic looking, flowers, looking, photography, poetry, ranunculus, spring, tulips. Bookmark the permalink. 3 Comments. And thank YOU. I particularly love yellow. And the shape of this last white vase.